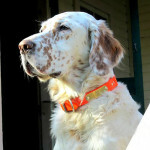 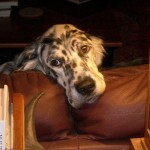 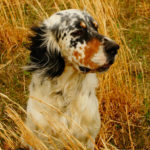 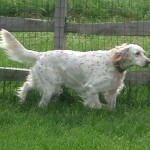 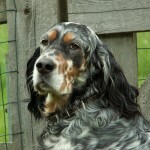 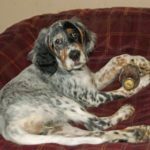 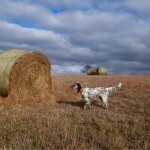 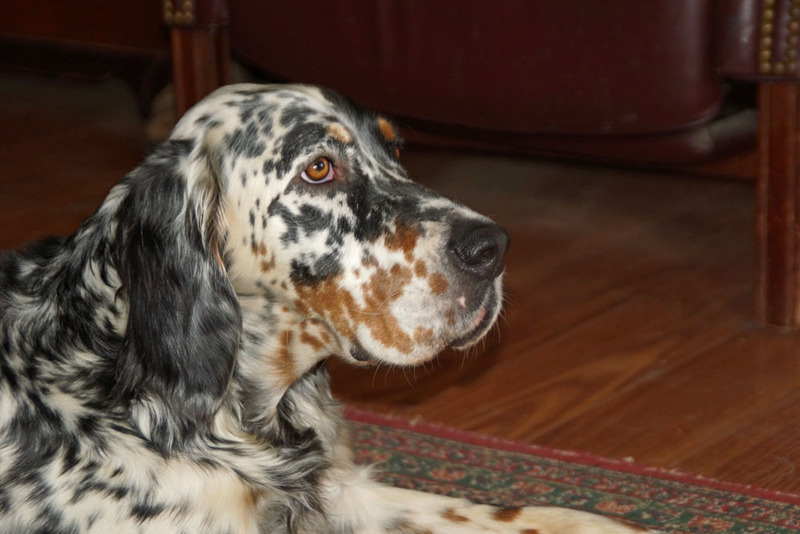 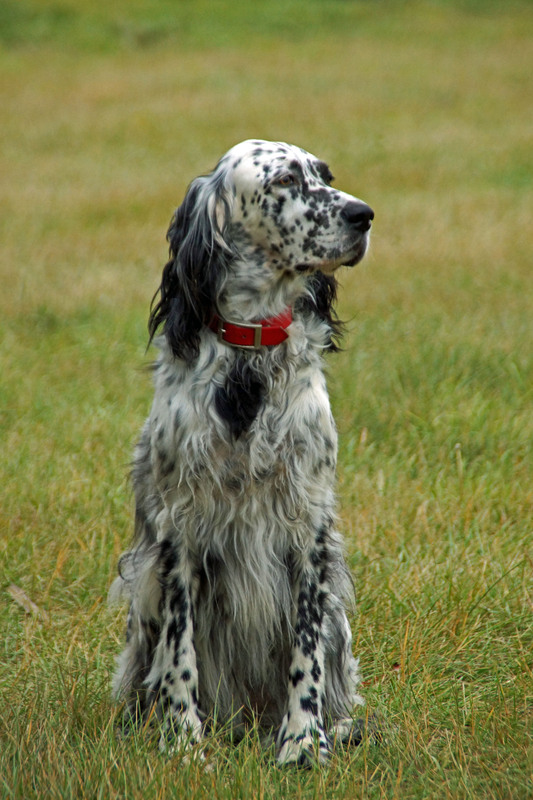 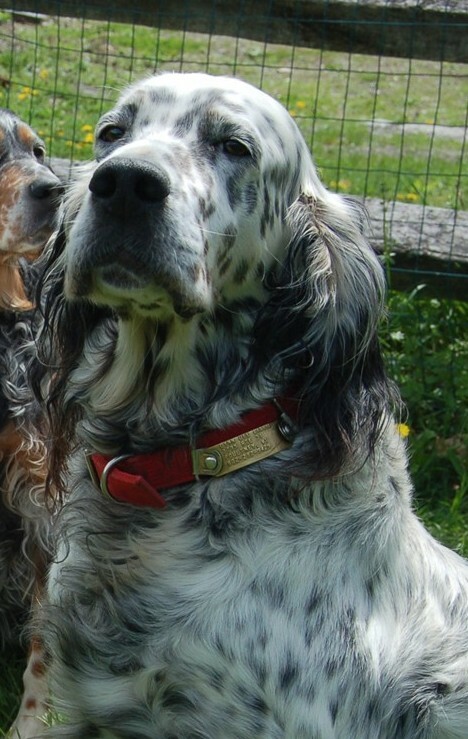 Our English Setters are of the “Ryman” type. 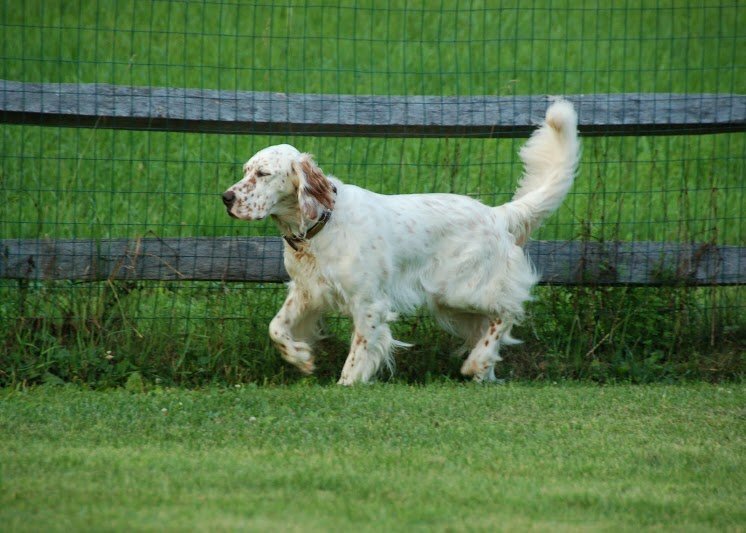 The name Ryman comes from the prominent breeder in the 1900’s who strove to produce a specific style or type of English Setter birddog. 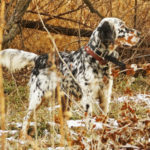 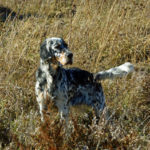 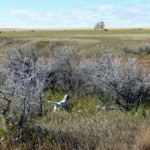 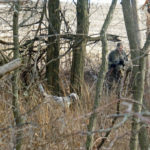 Although George Ryman is long passed, the type of setter he envisioned remains a favorite today of many hunters for their traits. 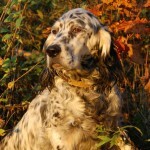 They are calm and affectionate dogs in the home with classic conformation and beauty. 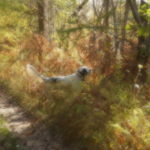 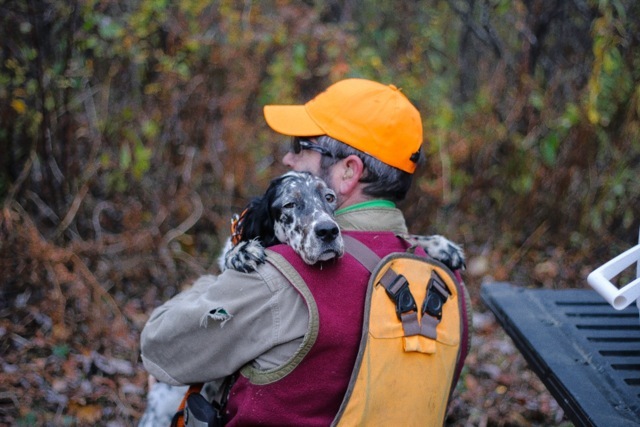 In the field and woods they are known for requiring little formal training to develop into biddable, staunch bird finders that will hunt with you as a team. 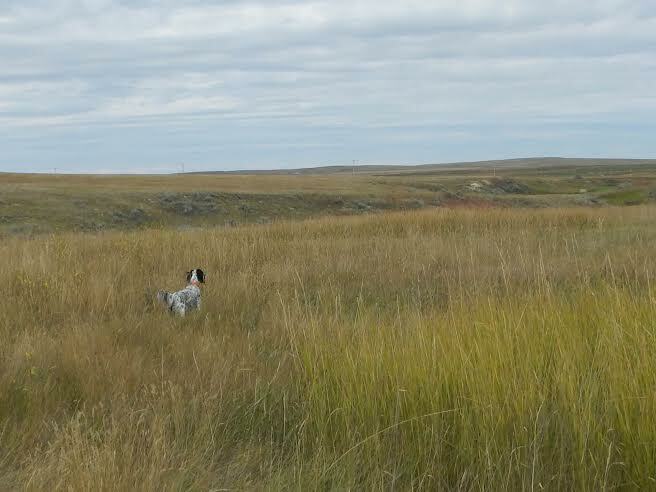 In thick cover they are close working and a bell is all that is needed but on the prairie they will accordingly range out to 200+ yards. 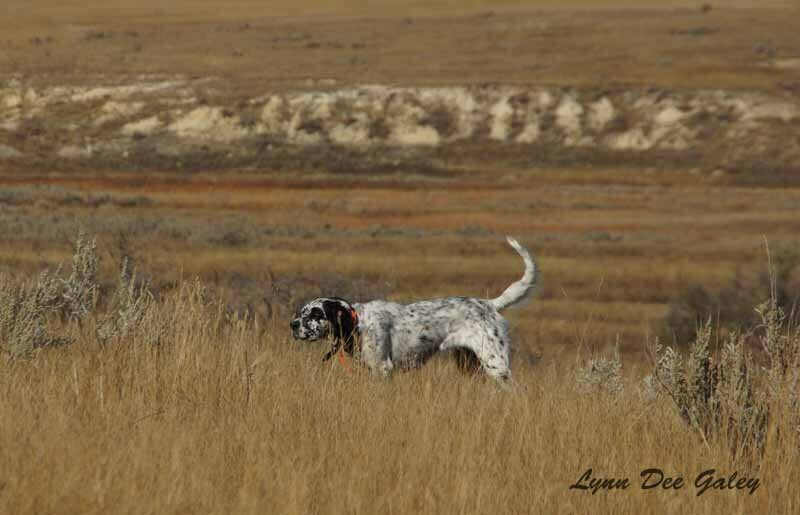 We love all of these qualities of the rymans but we spice things up just a little and prefer our personal rymans to be a bit faster and more animated when hunting and many point with a higher tail than typical for rymans. 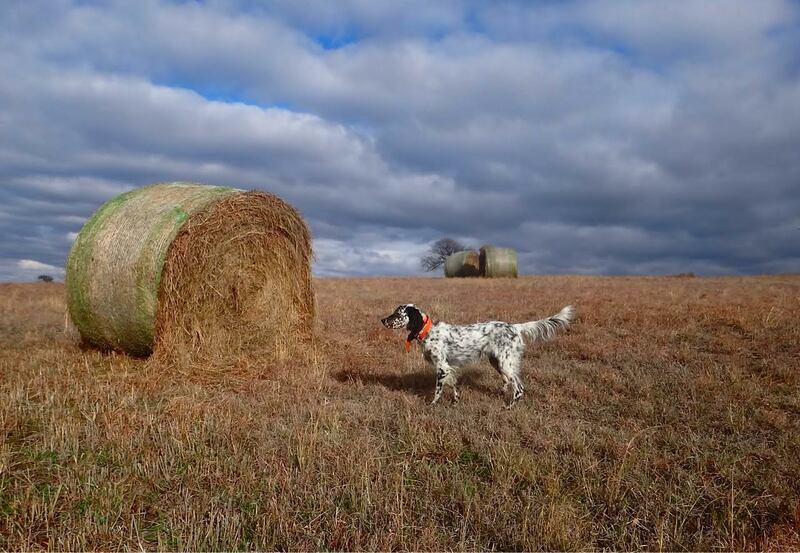 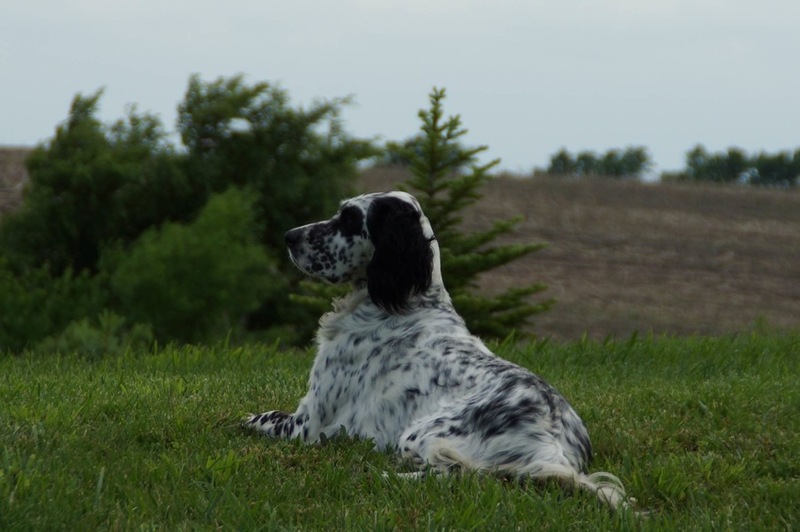 We feel strongly that simple obedience training, not electronics, is all that should be needed to have a bird dog that is both productive and enjoyable and that you can achieve this if you focus on both performance and temperament in a breeding program. 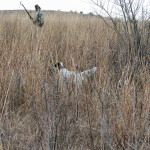 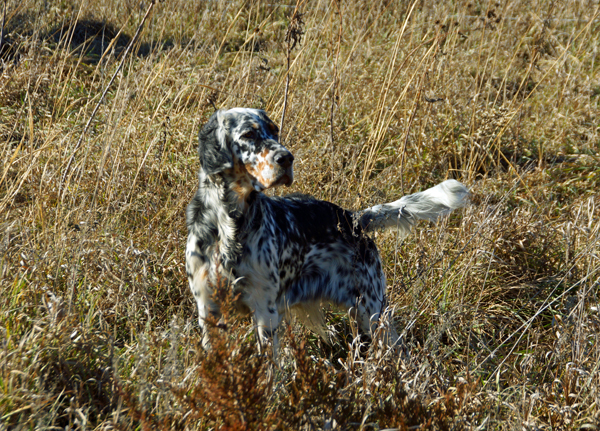 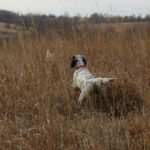 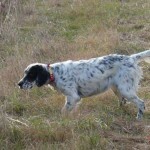 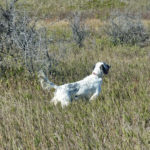 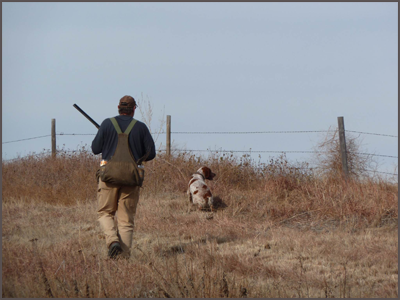 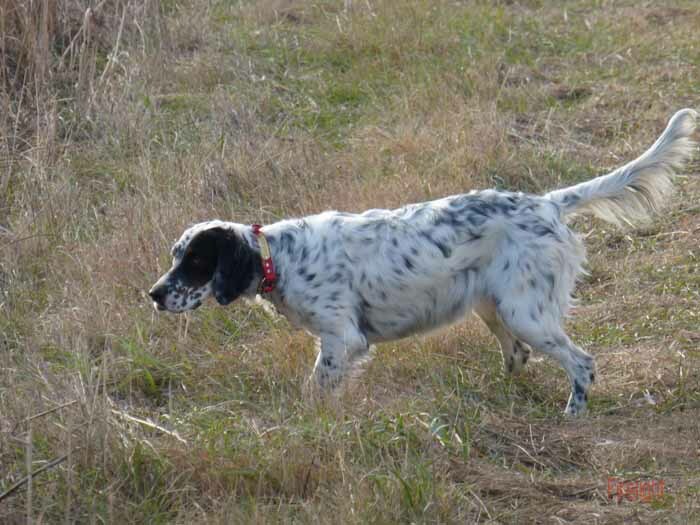 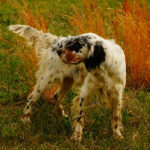 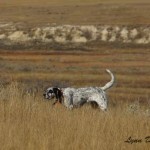 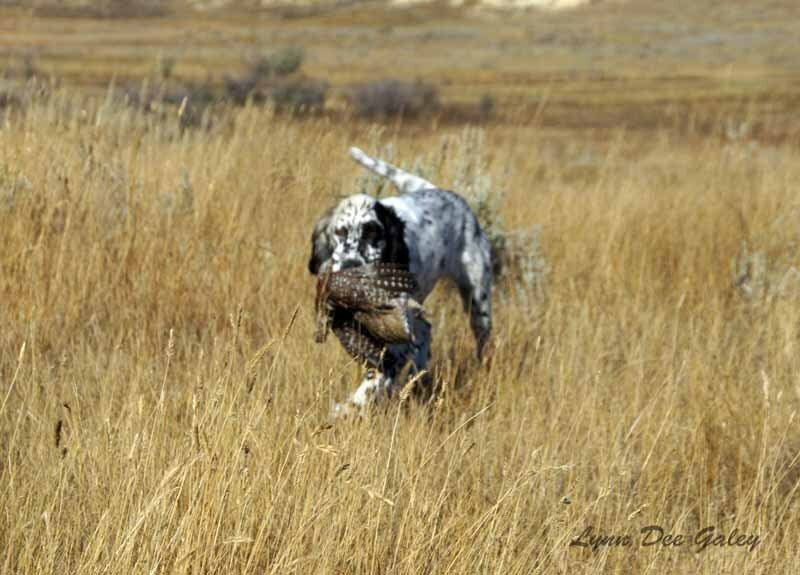 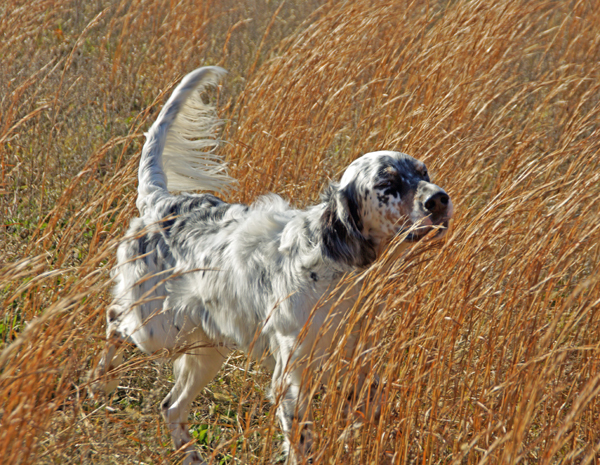 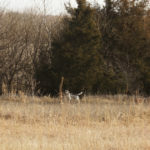 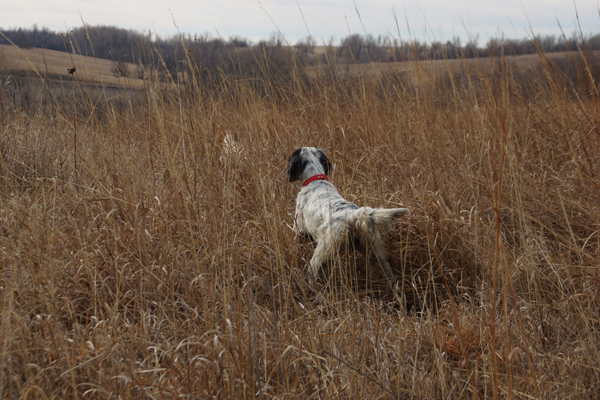 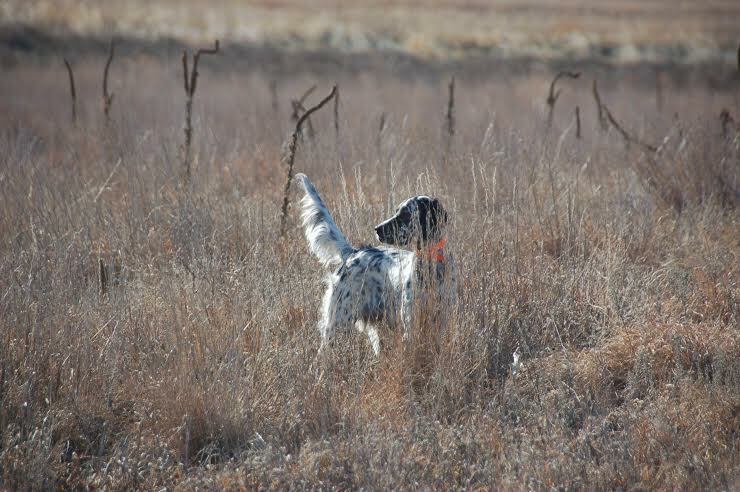 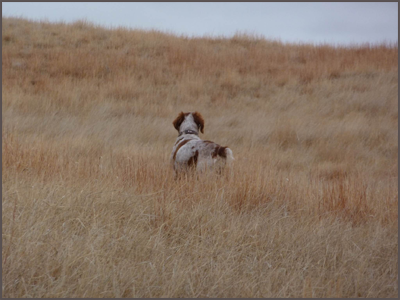 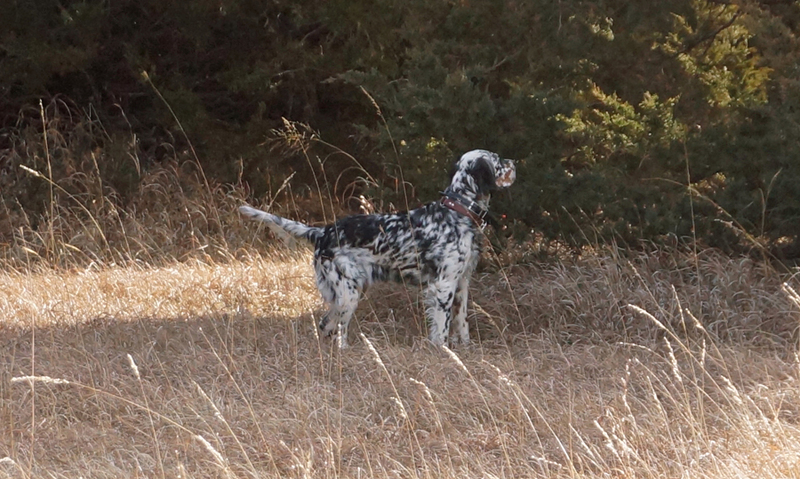 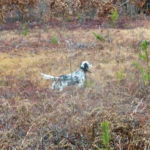 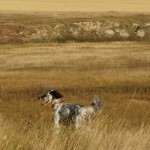 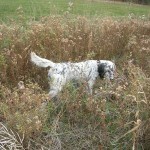 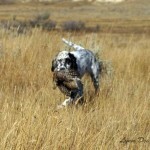 Our Setters are hunted extensively on wild birds before being bred and we breed only our best bird dogs. 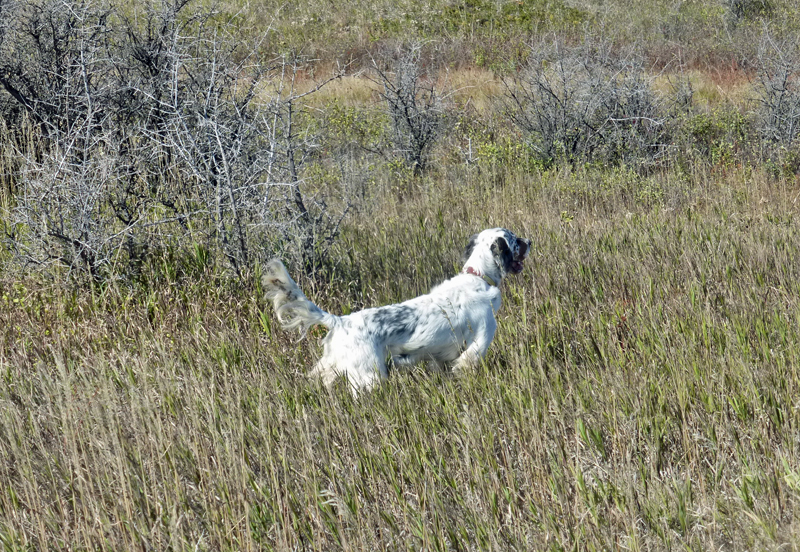 They may be beautiful and sweet, but rymans from us are also proven bird dogs which is the only way to assure that the field abilities of the ryman continues. 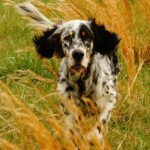 Scroll Down to see our English Setters. 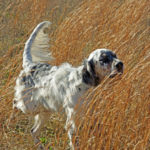 Click on the tabs and click on the thumbnail photos to enlarge them. 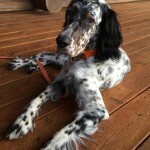 We are proud to be Founding Members of RymanSetters.com..
Tweed was one of those dogs whose sweet personality makes everyone she meets wants to take her home with them. 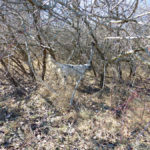 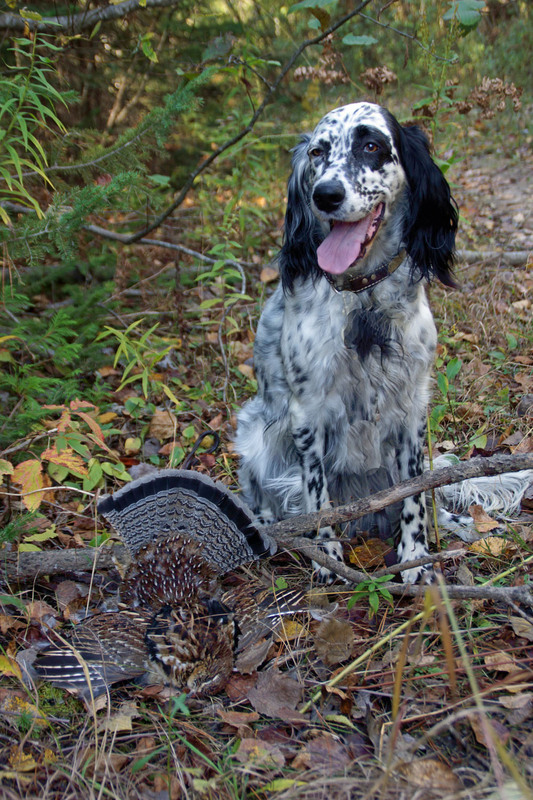 A heck of a ruffed grouse dog, she has now added prairie birds to her skills. 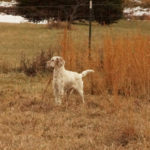 Tweed was a great producer even though bred to only two different sires and her puppies gave us an exciting future. 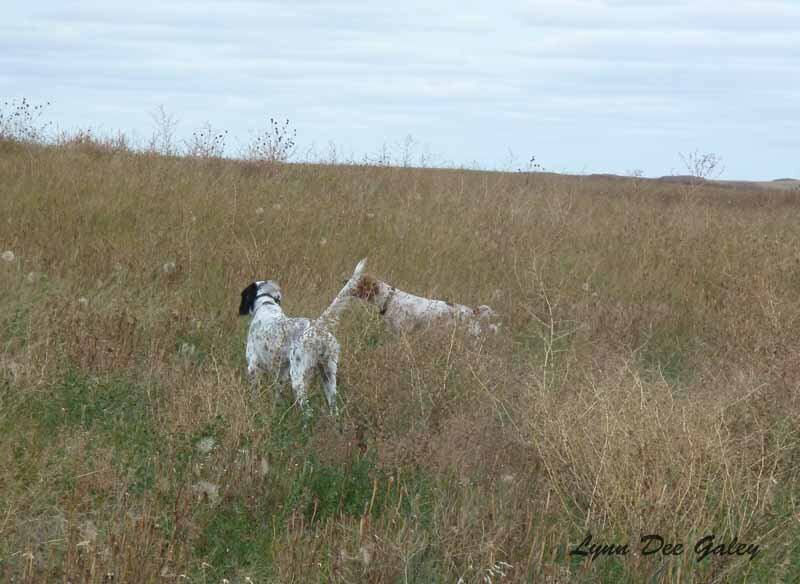 Pups from both of those breedings were natural pointing and retrieving as puppies and have gone on to be successful and stylish bird dogs. 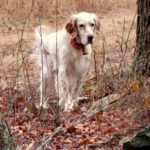 Tweed has now passed but remains so beloved and important to us that we chose to keep her profile up. 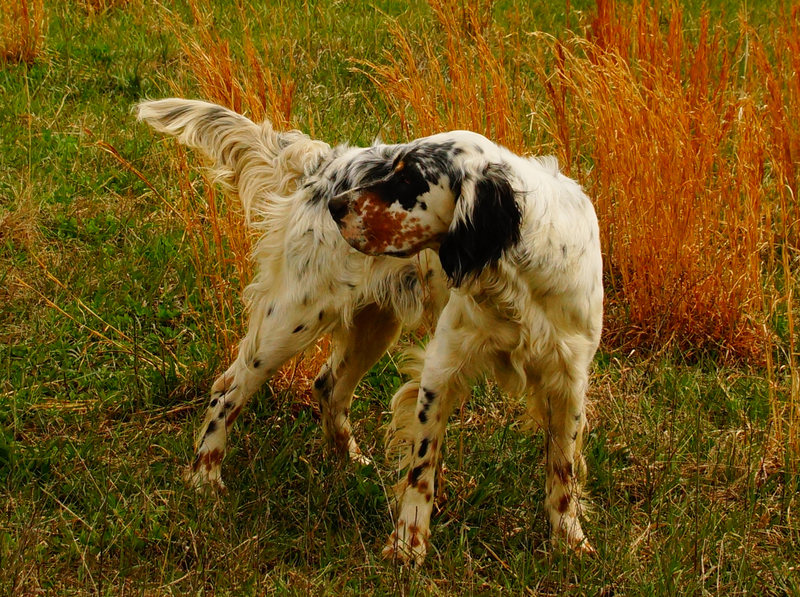 Kate is a striking tri color daughter of our Sally, her sire is October Mountain Heath of October Setters. 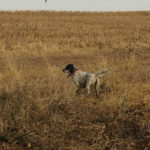 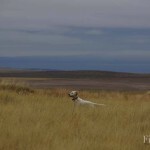 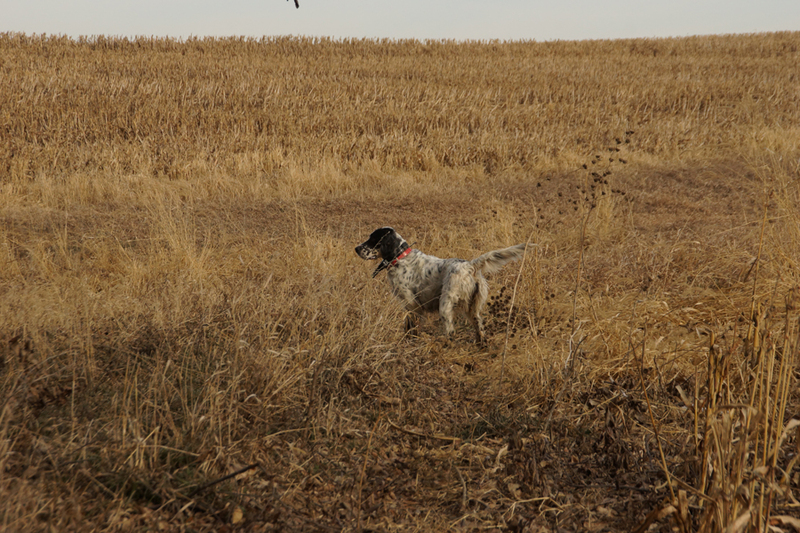 Kate is beautiful, fast, and driven for birds with a nice intense point and she retrieves naturally. 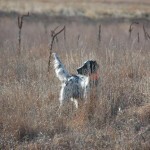 Despite her speed and intensity, Kate hunts for the gun and is a joy to follow and shoot over. 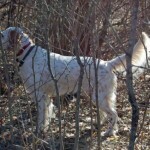 Kate is 52 lbs, OFA Good. 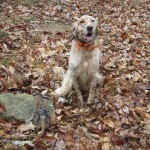 Flint is a handsome tri color male, whelped 11/15 to our Sally x October Mountain Heath. 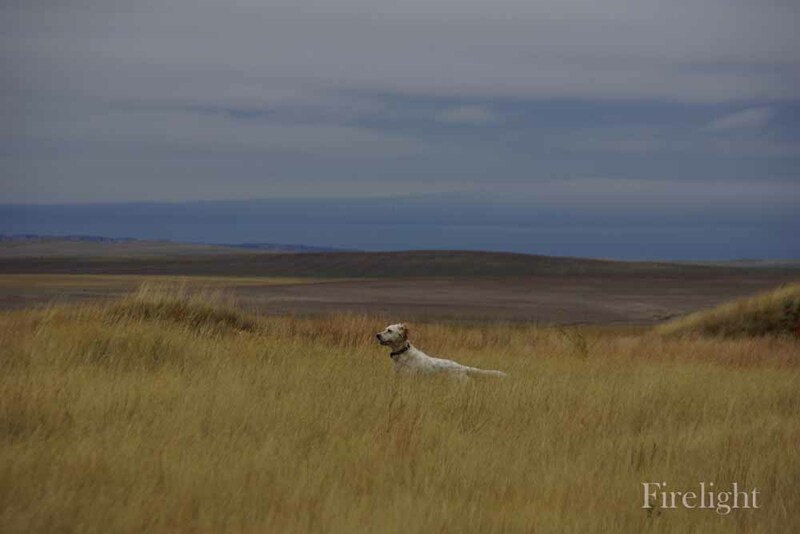 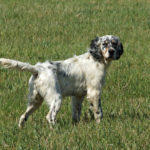 We do not usually keep male setters, instead keeping just females to hunt and further our line, but in his first year Flint showed us that he is going to be something special so we are pleased to announce that he is staying with us. 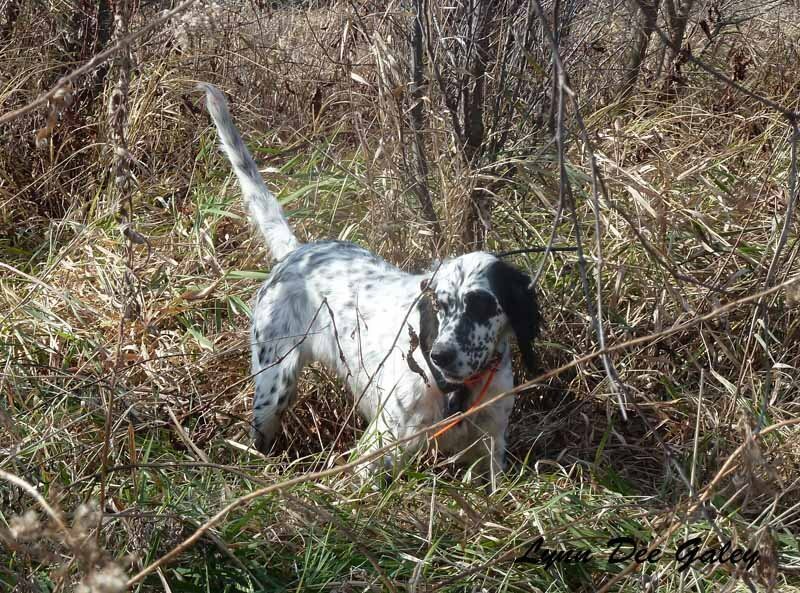 Flint is muscular and athletic with good conformation, a smooth, fast gait yet he is easy to handle and hunts at a very comfortable range. 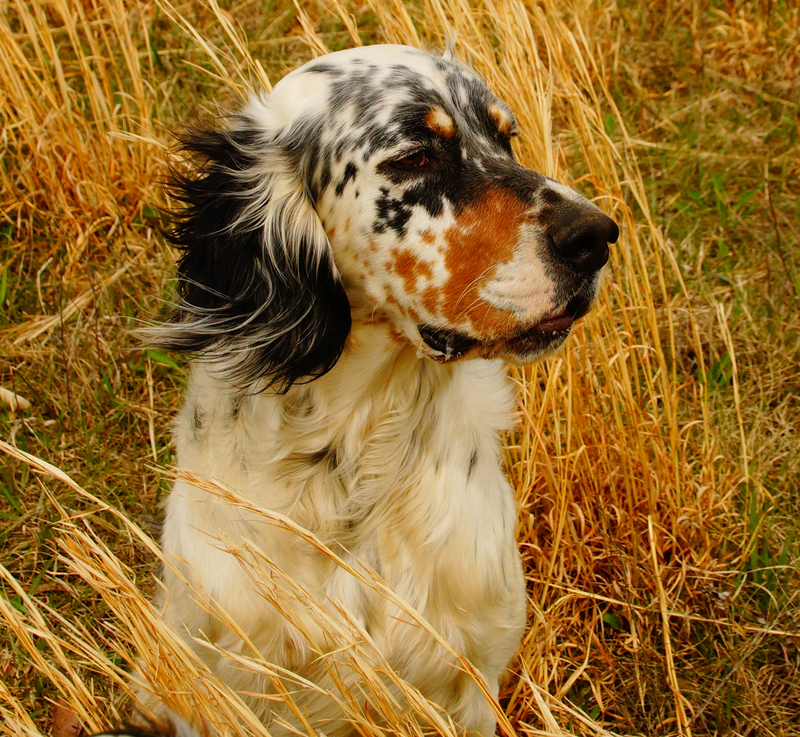 He is pure pleasure to hunt with, handling easy and is reliable, honest and stylish on his birds. 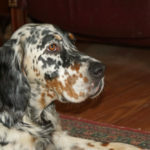 Around the house he is calm and kind, a gentleman and a pleasure to be around. 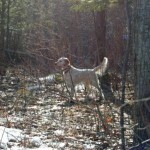 Flint is 57 lbs, OFA Good. 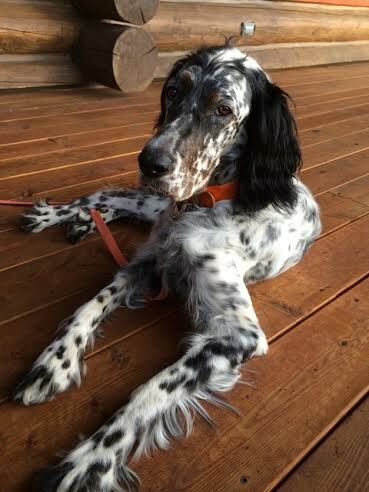 The newest addition to the Firelight pack is Dreamboat Annie, riding on the waves, this lil darlin’ one’s mother is Mustang Sally. 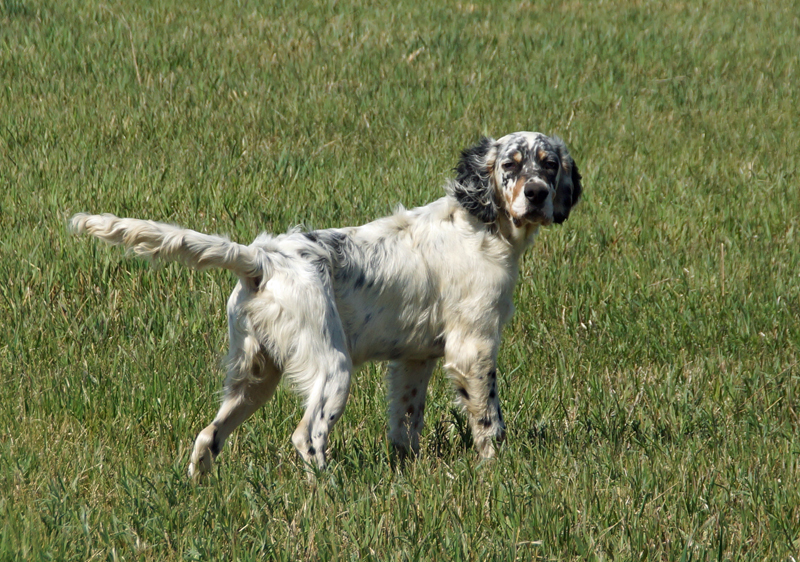 Annie introduces some fresh and exciting bloodline to my pack through her ryman-llew cross sire, October Blue Doc. 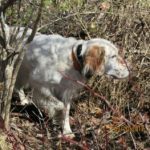 I had the pleasure last January of hunting with Doc, his littermate and one of his offspring and knew that I wanted to mix their strong field talent with my own dogs. 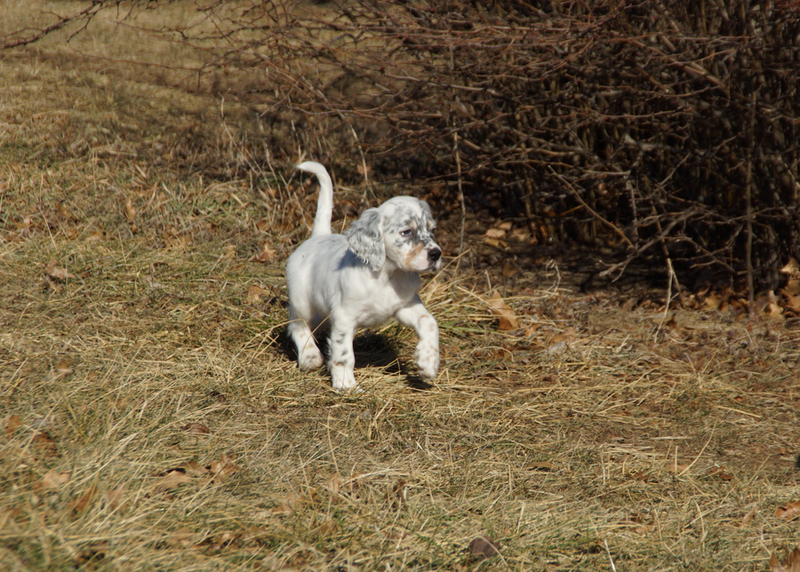 Annie was born June 8, 2018 so this fall will mostly be just a tag-along while hunting. 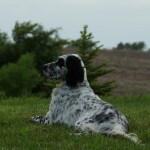 Dixie is a full sister to Sally above. 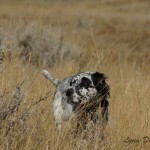 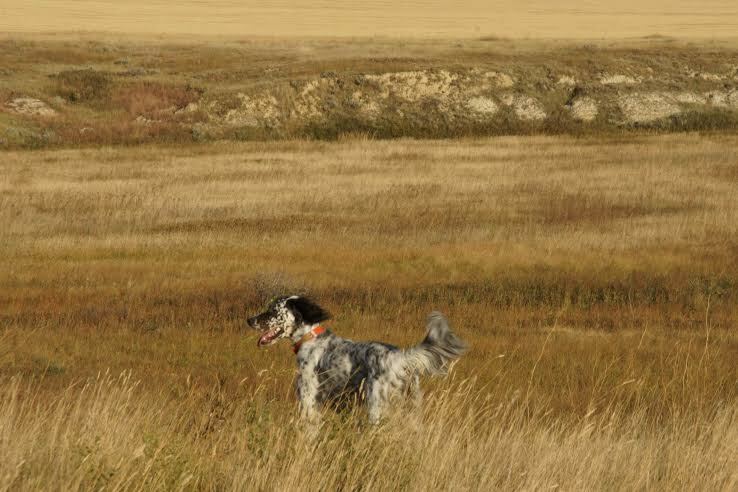 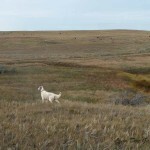 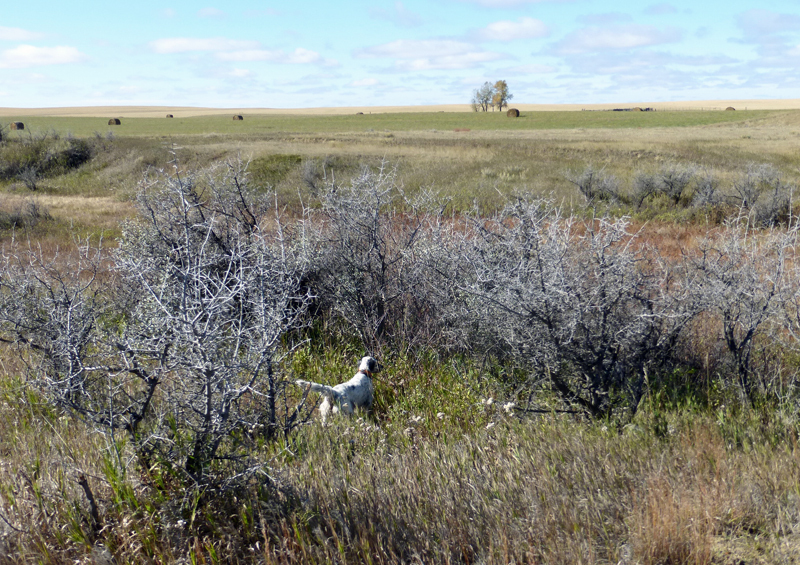 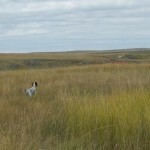 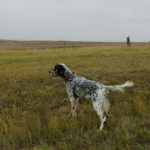 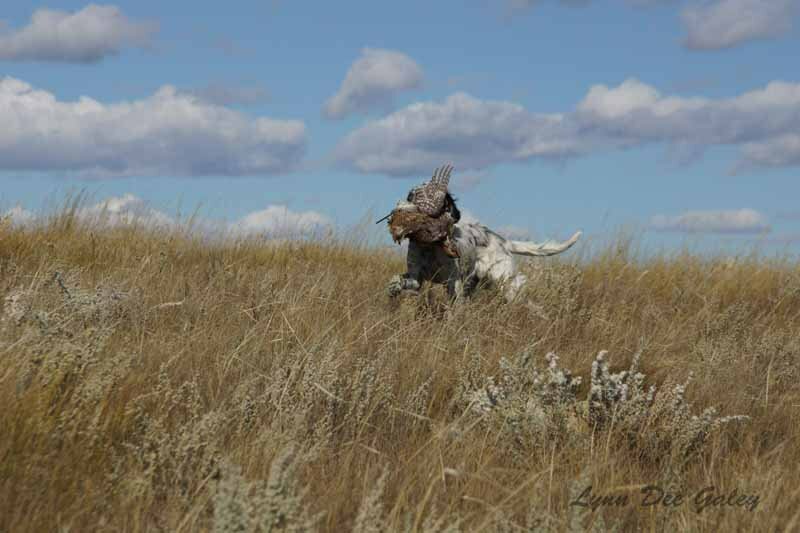 She is loved and hunted on grouse and woodcock by a close friend in Vermont but Dixie also gets to spend time with us each fall hunting prairie birds in Montana and Kansas. 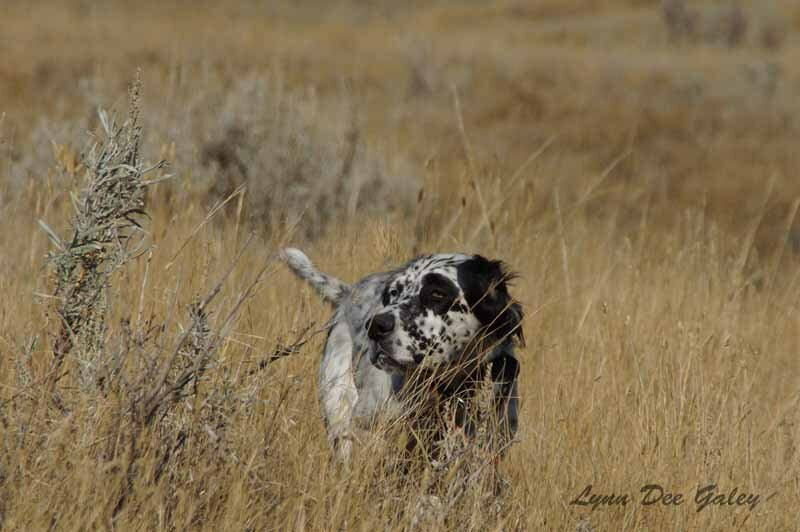 Dixie hunts fast and with drive, backs, and has lovely style on point. 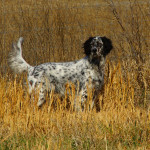 She is very attentive in the field and checks in on her own or by whistle. 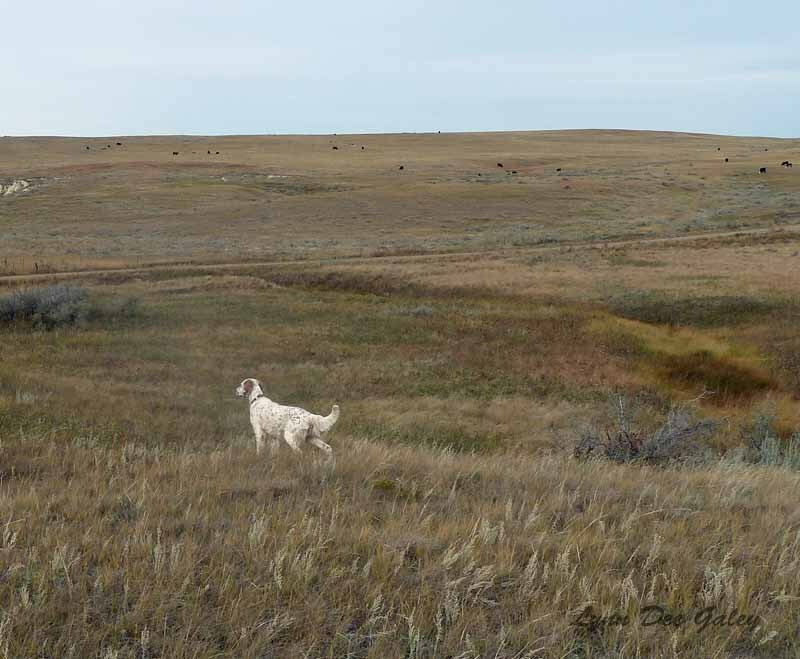 She ranges nicely on the prairie and at the edge of the bell in the woods. 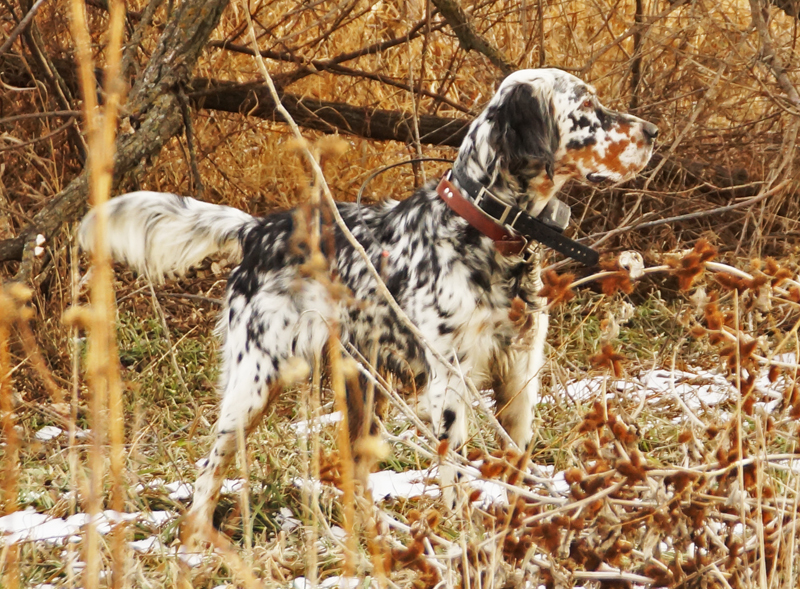 Like all of our dogs, she has been trained by exposure to wild birds in a variety of habitat. 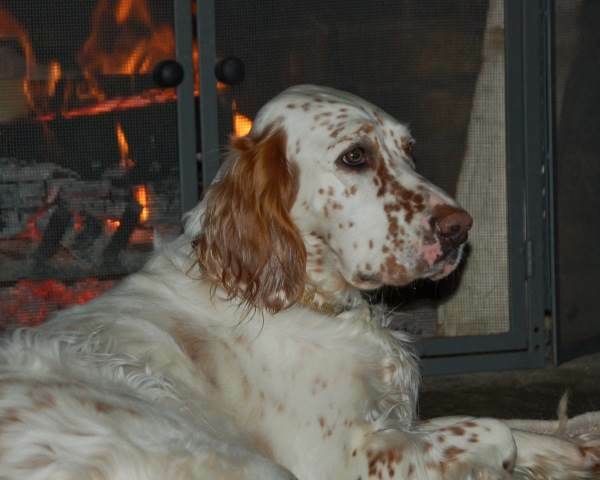 In the house she is sweet and affectionate and lays claim to the sofa and laps. She is also a Certified Therapy Dog. 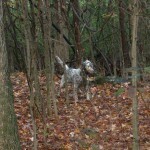 47 lbs. 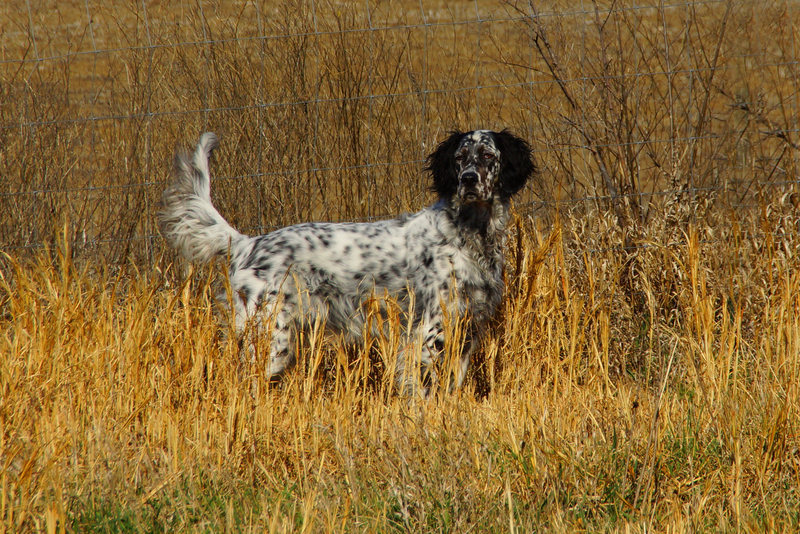 OFA Excellent Dixie will be in Kansas with us this winter (Feb 2016) to be bred and raise a litter. 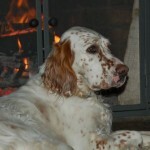 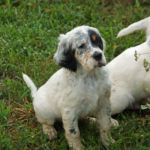 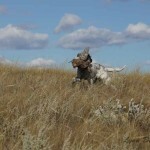 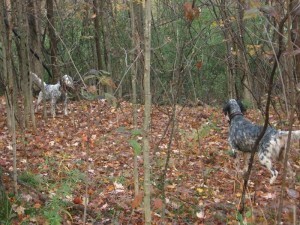 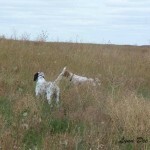 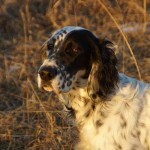 I am asked by many if I keep any Ryman Setter stud dogs. 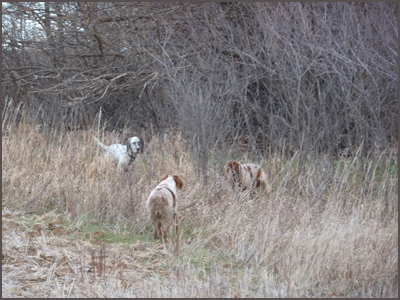 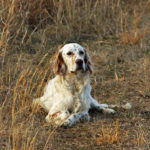 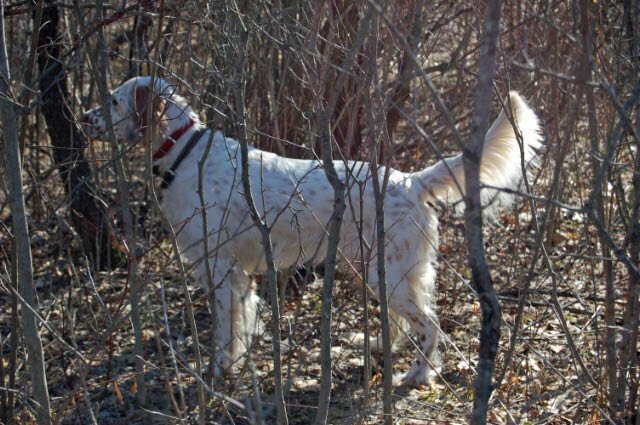 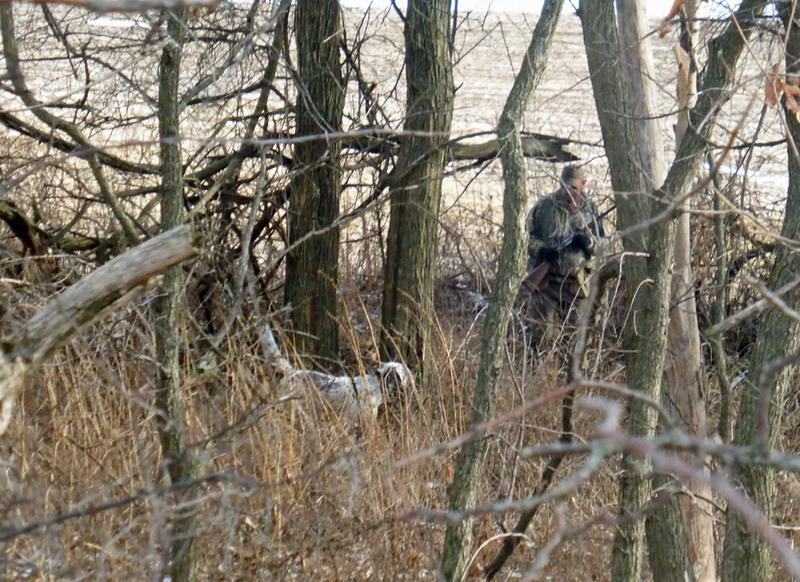 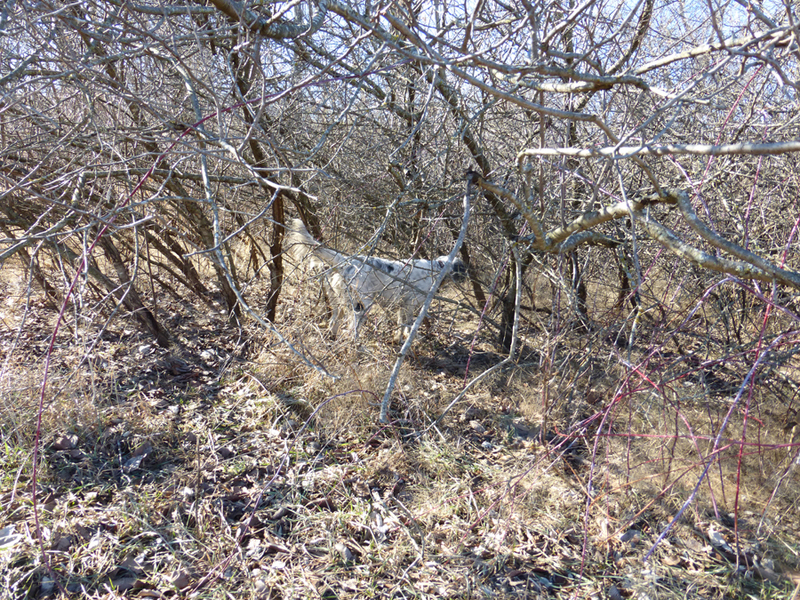 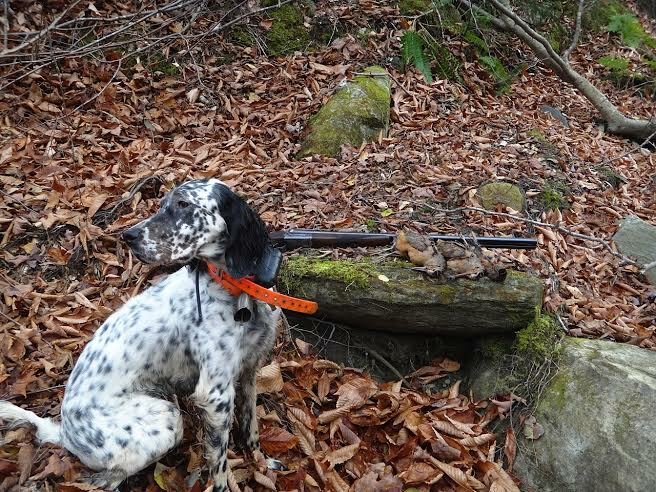 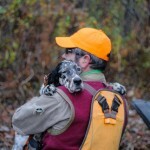 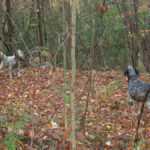 To maintain the number of dogs that I am confident that I can spend plenty of time with and hunt enough to truly evaluate them I typically chose to keep only female setters. 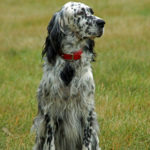 This also allows me to travel to other reputable breeders and breed to the male that I feel is the very best match for each particular female. 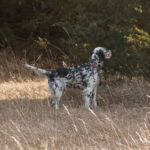 However, since I closely follow my pups throughout their lifetimes I have contact with and access to some very nice males of my breeding that are owned and hunted by others. 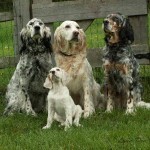 The following stud dogs are examples of my breeding, if interested in any of these males contact me for more information and the contact info. 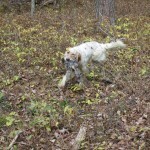 Parker (in Massachusetts) (OFA Good) Parker is a lovely 60 lb male, a full brother to my Storm. 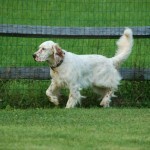 Parker offers a very desirable pedigree with his direction connection to the now-retired PineCoble Kennels of NY. 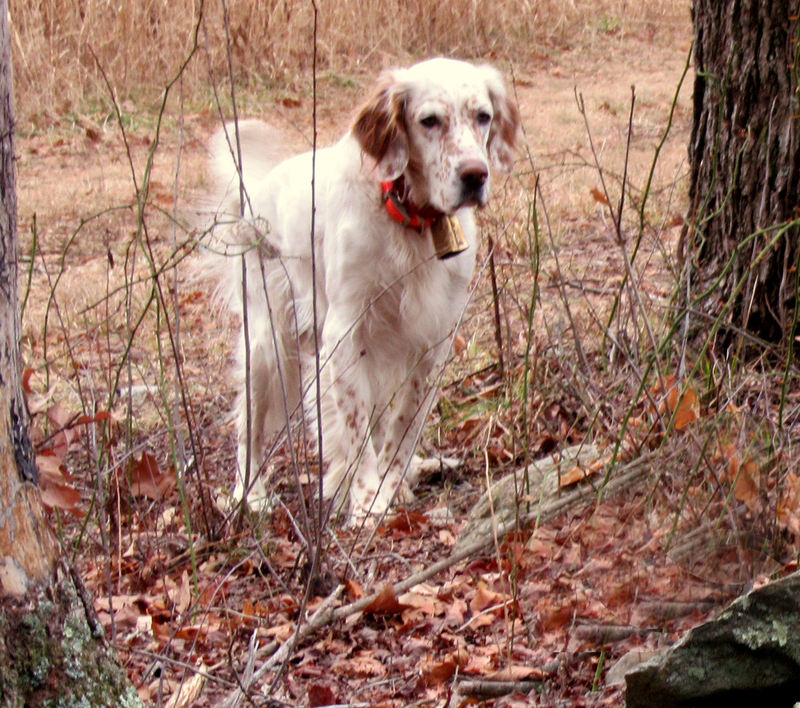 Parker’s mother is my Tweed who has been an outstanding producer and his sire was Pinecoble Talus, well known for producing quality bird dogs. 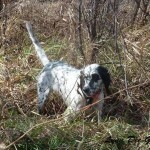 Seth (in West Virginia) (OFA Good) Seth is a fast, hard-driving hunter, mid-50’s for weight. 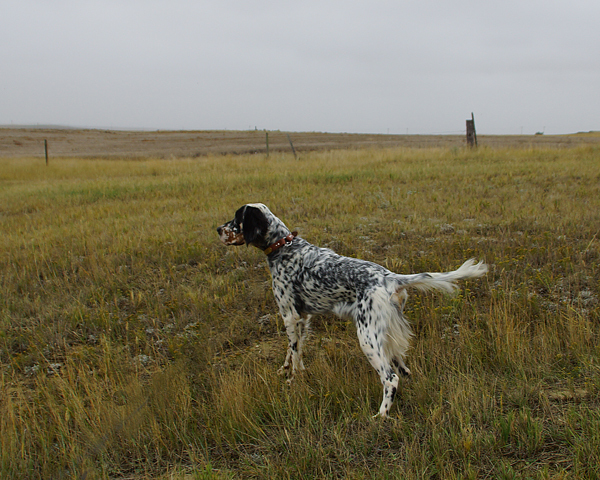 He is a full brother to my Sally so is also a son of my Tweed who has been an outstanding producer, his father is a handsome tricolored grouse dog bred by a friend. 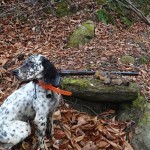 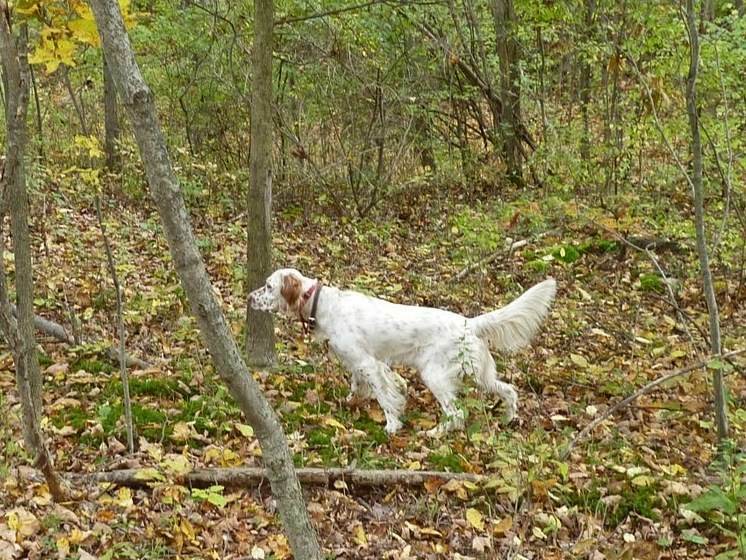 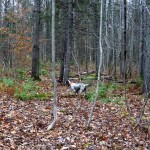 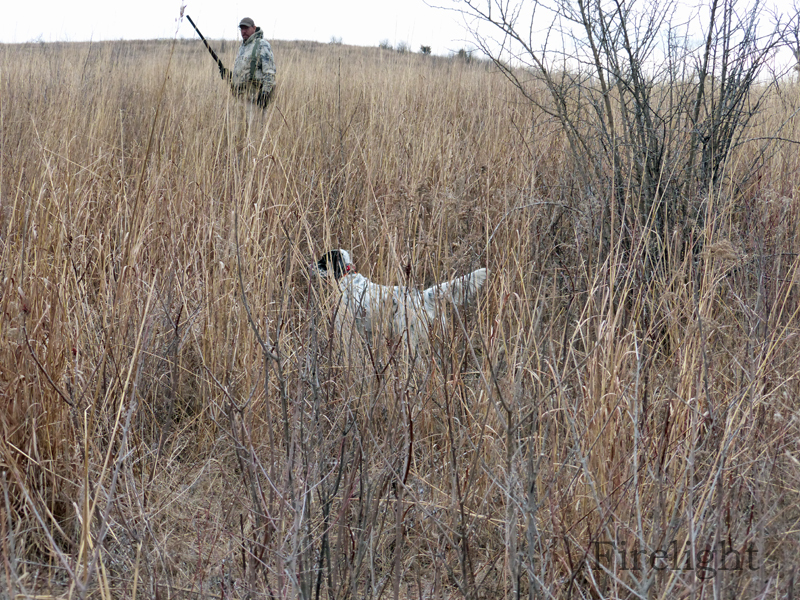 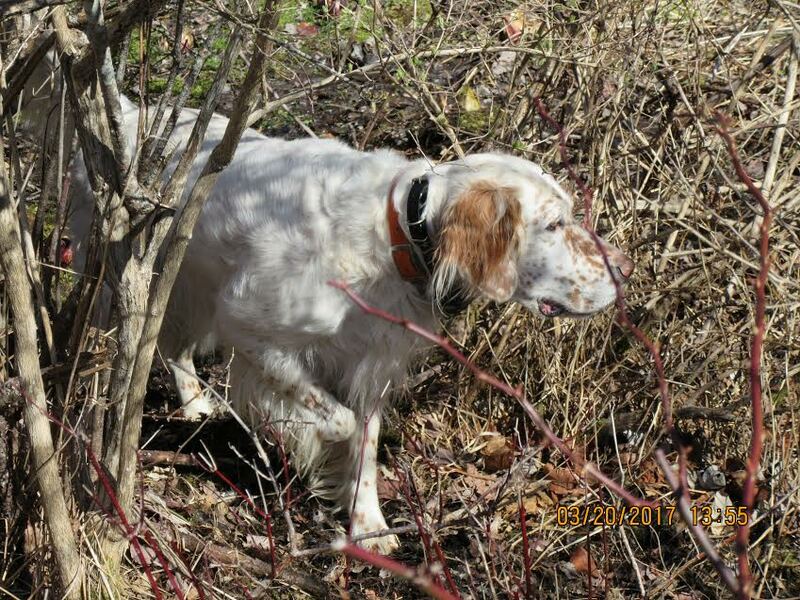 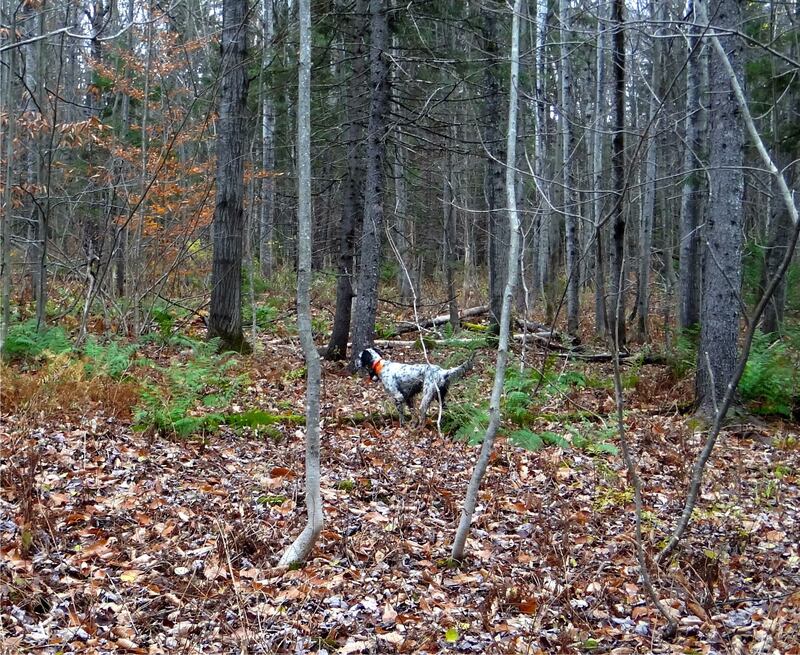 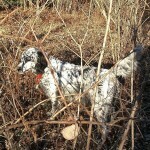 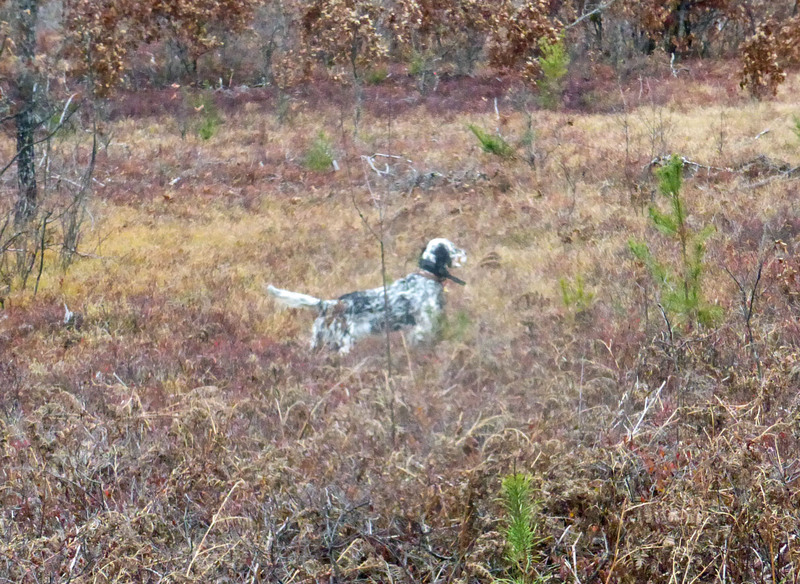 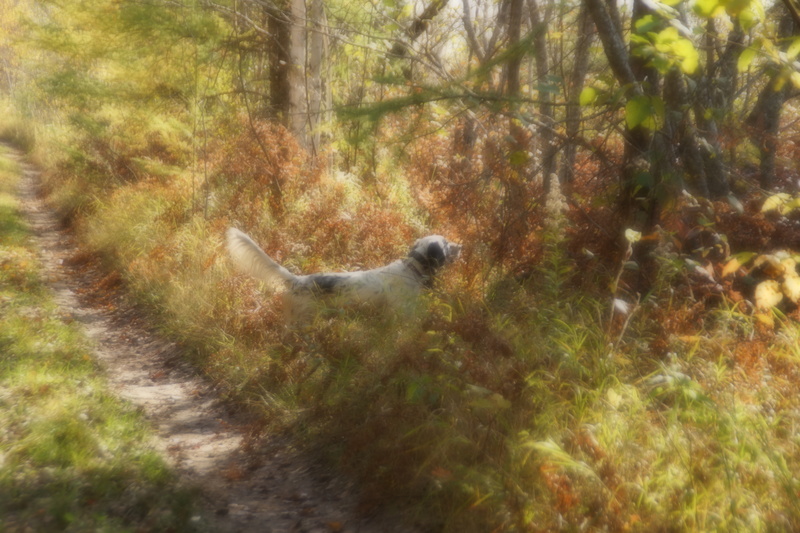 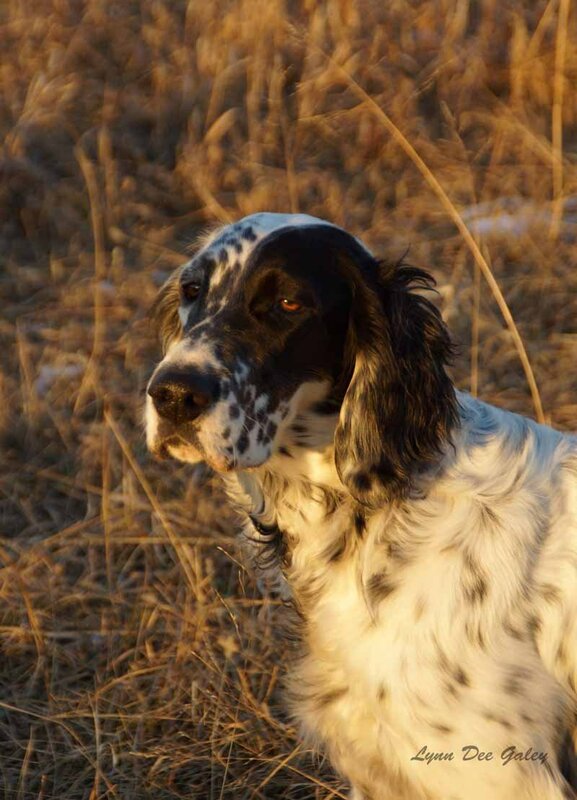 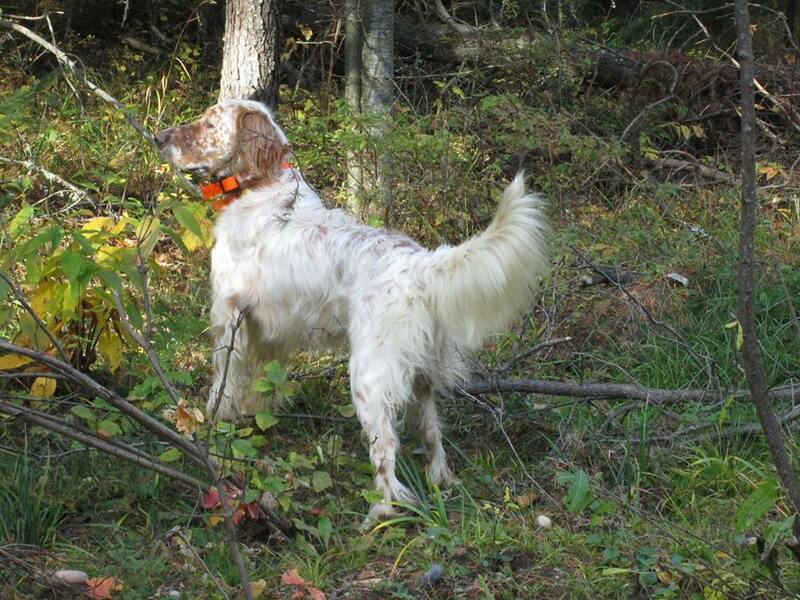 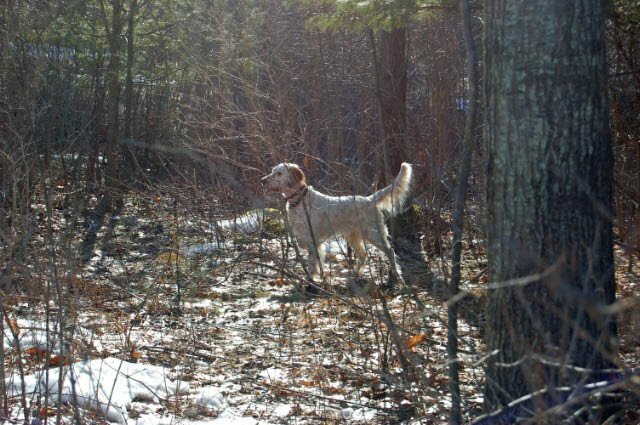 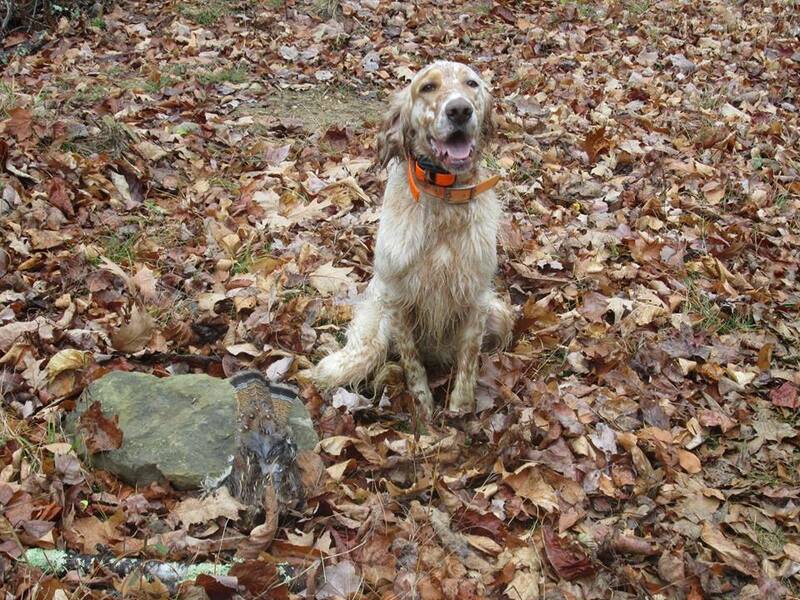 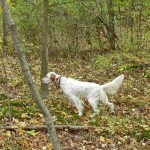 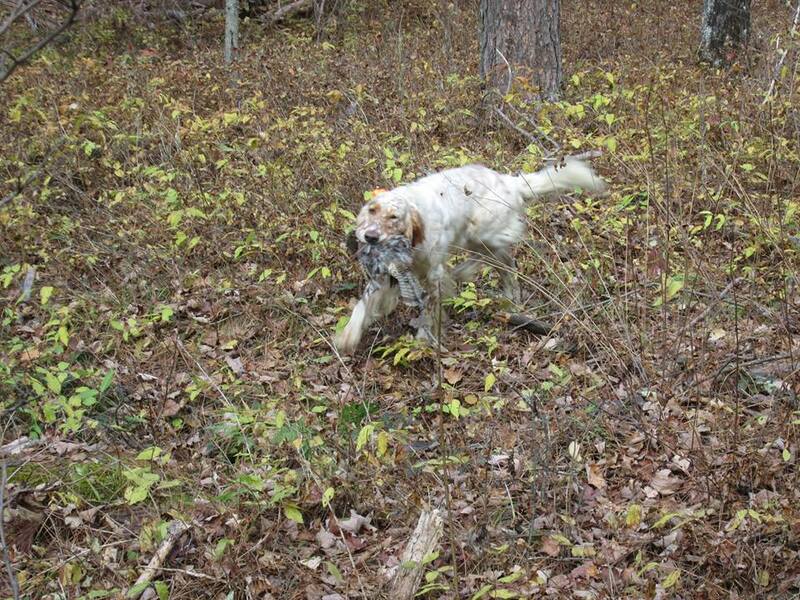 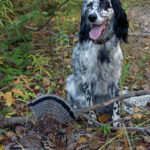 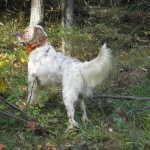 Seth’s owner recently described Seth on ruffed grouse as “on fire” providing many opportunities for the gunners. 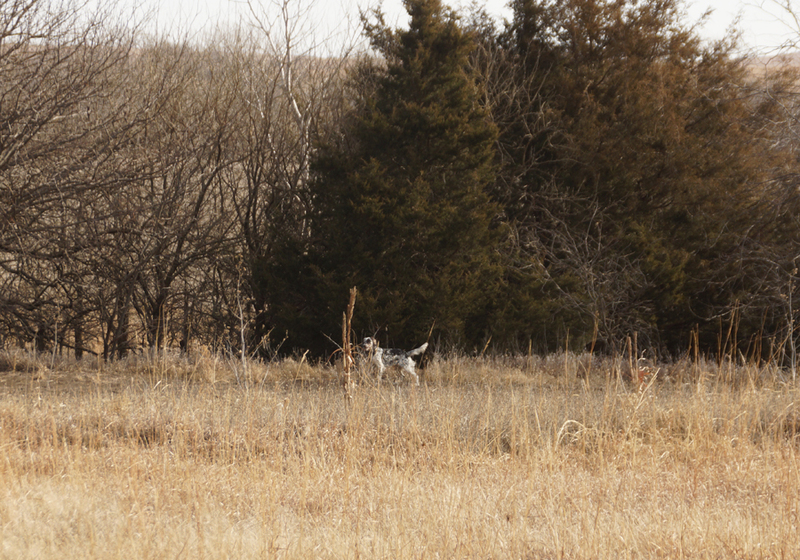 This page is an extremely difficult one for me. 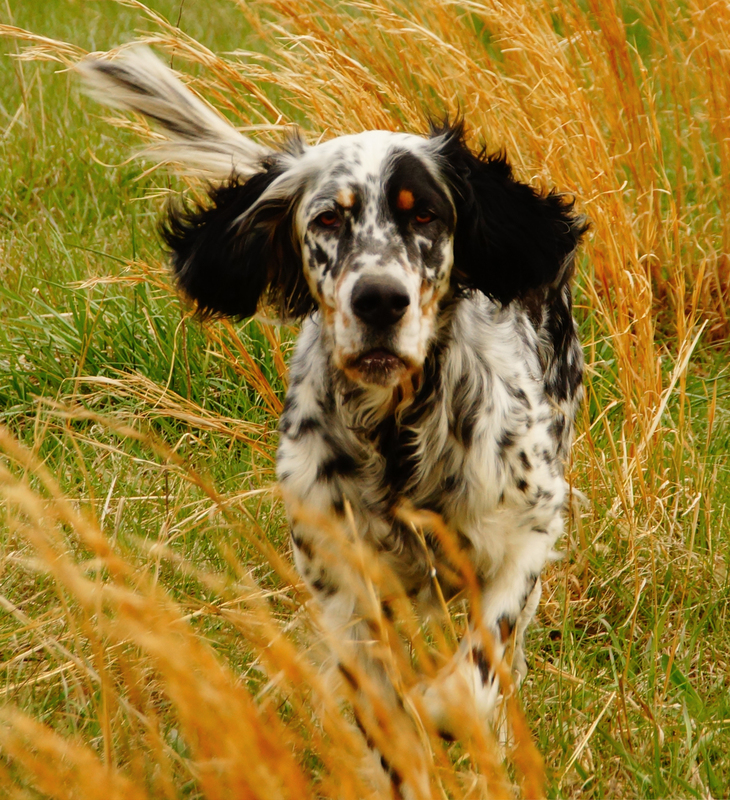 My setters have always been a huge part of my life and I have been blessed with amazing and wonderful dogs who leave a huge hole in my heart and my home when they pass. 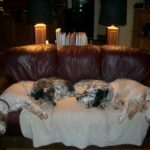 Words fail me so I will simply share a few photos of some of the beloved 4 generations that came before, and gifted me with, my present dogs.